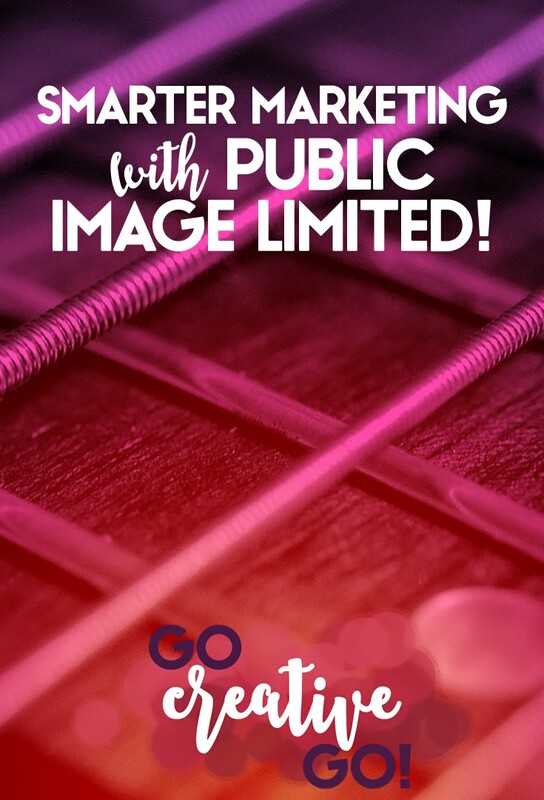 Smarter Marketing with Public Image Limited - Go Creative Go! How Important Is Your Public Image? Pretty ding-danged important, especially as a small business owner! Your public image is your first impression, what your potential prospects and peers see first. It’s important to remember, though, that your public image has to portray the real you, not just the perception you think your industry requires. The Return Of Music & Marketing Mondays! If you’ve been following along with my publishes for even a little while, you’ve probably sussed out that I have no problem speaking in my own unique voice. I’m a champion at sharing my opinions and diving into dissenting discussions. As I return to researching, writing and publishing my music and marketing articles, I knew I had to dive back into it with John Lydon, formerly Johnny Rotten, and Public Image Limited. If you’re looking to someone to inspire you to be the “real” you, he’s certainly not one to temper his speech. I’m certainly not saying he’s someone to emulate at all times, as he’s rather strident, often belligerent, and sometimes downright mean. But, if you’ve too long been hiding the real you from your peers and prospects, you’d be hard pressed not to let loose a little real after a few listens. Perception plays a huge role amongst our peers and prospects, especially in the digital space. Our public image is particularly important when impressions are made without the benefit of a face to face, or the opportunity to hear vocal tones and delivery. That being said, when people only see what’s immediately visible on the surface, our real selves are often misinterpreted. Social proof becomes more important than sincerity and time spent in the trenches, actually doing the work. It’s important to look past the clothes the social account is wearing (the size of the following, the shares of influencers) and dig a little deeper into the person and personality behind the very public, but partial, persona. Gurus, you’ve been sussed out and we’re not falling for it! This song could have been written with digital marketing fauxperts in mind, don’t you think? Do you want to work with a marketer or designer who’s truly got your best interests in mind? Of course. You can’t fall prey to the song and dance of the digital marketer whose public image is based on smoke and mirrors. Don’t be seduced by a marketing firm or influencer that can’t give you a straight answer about how they make it work. Look deeper for the sharing of solutions, nit just the sparkle. While there’s not a whole lot in the lyrics to interpret, as the title/chorus is repeated more than anything else, there is a message here for those doing business. It’s not all about popularity. It’s about running a business well. Sometimes, especially at the solopreneur level you have to share the wisdom that won’t win you any popularity awards. You have to evolve and change as your industry changes, as your audience grows and matures, as your peer group moves in different directions. All things we should be in business. All things we should look for in the freelancers, small businesses and agencies we hire to help us build our own businesses. What kind of company, or individual, do you want to work with? One that leaves you to traverse the road ahead alone? Or one who has traveled the road before and knows the best direction and route to take? I want to work with someone who will admit they’ve taken a wrong turn or three, and is willing to share what they learned as they tried to get back on course. I want to work with someone who’s willing to help guide me to the safest, smartest route. The kind of business relationship that helps both parties rise up, take steps forward and grow, is the kind of business relationship to which we should aspire. I know I can get a little flowery and wax poetic when I share these music inspired publishes. But, I hope that the inspiration behind each song and each share actually comes through. Music often shares what we’re unwilling to discuss in polite company. It can be raw and emotional in its honesty. While I know that professionalism must be maintained when prospect and peer discussions take place, it never hurts to draw upon our gut and dig deeper than the public image, the perceived professionalism of the prospective hire. How deep do you dig when deciding to connect with and potentially work with a peer or prospect? Expertise: Everything You Need To Know Ain’t Immediate! Killer Content Marketing Creates Opportunity!